Craig Mills’ shocking photo of one of our freshwater crocodiles – poisoned and killed by eating cane toads - floating on, rotting in and polluting a pristine Australian billabong after emptying its bowel contents all over the belly of its dying carcass. This fate awaits the rare Bullo River pygmy crocodile and all other inhabitants of these systems. Craig’s photo was taken on one of his regular toadbusting trips to the Northern Territory, on a billabong between the West Baines River and the Pinkerton Ranges , shown in the extreme background reflecting their pink hue. 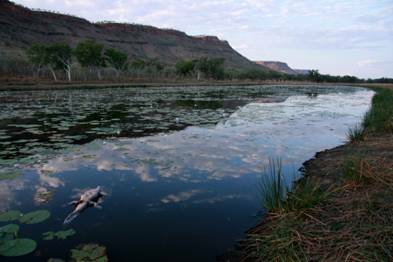 This billabong is around 80kms from the WA/NT border as the eagle flies. Craig caught 600 cane toads that night at this billabong after snapping the dead crocodile. Craig is one of the very small Kununurra based DEC cane toad team who work closely with the KTBs. In writing her internationally famous 1993 biography From Strength to Strength, Sara Henderson would not have dreamed that a rare pygmy crocodile was living and breeding on her beloved Bullo River Station . Sara would also be horrified to find that no sooner has this rare crocodile species been discovered on Bullo, the feral, prolific breeding, and very poisonous cane toad is about to arrive … and there is no Australian predator of the cane toad (in any stage of its life cycle) that is immune to its poison (except maybe the keelback snake). Photo: Fresh water gorge on Bullo River Station – what will cane toads do to this ecosystem and its dependent inhabitants? 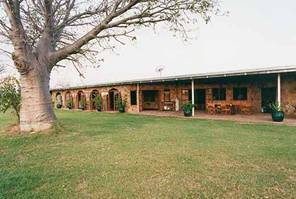 Remote wild Bullo and Victoria Rivers flow through spectacular freshwater gorges within the 1,200 square mile Bullo River Station. These gorges are home to frogs, reptiles, saratoga , sooty grunter and barramundi; and then finish their journey into huge tidal flows where species such as saltwater barramundi, threadfin salmon, mangrove jacks and jewfish thrive. Cane toads, in all stages of their life cycle, will kill these fish. The KTBs wonder just how many unknown Queensland species suffered extinction from cane toads? The Arnhem Land population of pygmy crocodiles at the Liverpool River was overrun by cane toads in 2000/2001 and their fate is unknown? Bullo River Station owners, Franz and Marlee Ranacher need help to build pens to protect these crocodiles from cane toads, and to catch and kill cane toads. The Kimberley Toad Buster volunteers are working closely with Marlee and Franz to help them save the pygmy crocodile, and the pristine Bullo River Station ecosystems (and their dependent biodiversity) from the imminent ravages of the cane toad. Cane toads will reach Bullo River Station through the upper reaches of creek systems flowing into the Victoria River north of the glorious and remote Pinkerton Ranges . This particular colonising corridor of the westwards moving cane toads (moving steadily west from Fancy Creek) is being fed primarily by toads crossing the Victoria River from their safe breeding grounds on the Commonwealth controlled Bradshaw Military Base, located on the northern banks of the Victoria River.